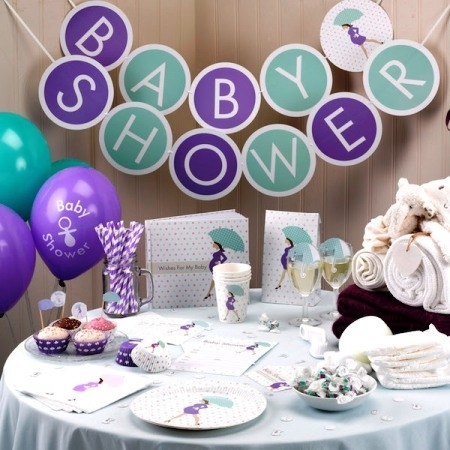 In this section you will find a large choice of baby shower themes and tableware ranges . We have specially selected the best baby shower ranges from around the world to help you organise the perfect party. From our vintage rock-a-bye theme to the fantastic guessing gender reveal range. All the tableware themes contain items such as plates, cups napkins, table covers and even cake stands! plus lots more to choose from. We have divided this section into boy, girl and neutral to help you select and also included plain coloured tableware to compliment your chosen design. All Baby Shower orders over £20.00 will receive a FREE New Baby Prediction Chart. As food and the table is often central to a great party our matching ranges of napkins and disposable plates, table covers and cups sets the perfect tone. From each design you can also choose other baby shower decorations including balloons, banners and confetti to really add those finishing touches to your party room. We even offer matching invitations and thank you cards to keep to the theme you have chosen.